Can your home get faster broadband? Most people now use the internet every day. It’s become the fifth utility for many people with the speed and quality of broadband becoming ever more important. At least 93% of Bristol can already access superfast broadband, however, many residents are not aware how to access faster speeds and get a broadband package that suits the need of their household. It’s important to remember that as the city’s broadband infrastructure is upgraded, you often don’t automatically get faster speeds. It’s therefore important to know your broadband speed, current package and the options that are available to you to go faster. How does broadband get to my home? Broadband infrastructure for residents is largely provided by Openreach (a BT business) and Virgin Media. Some areas of Bristol are covered by both companies, whilst some areas only have infrastructure from Openreach only. BT Openreach’s infrastructure is open to a range of internet service providers (ISPs) like SKY, Plusnet and Talk Talk. Virgin Media’s cables only supply broadband from Virgin. If you are served only by Openreach’s cables and they have not upgraded to superfast, you will not be able to currently access superfast speeds. Can you get superfast broadband? 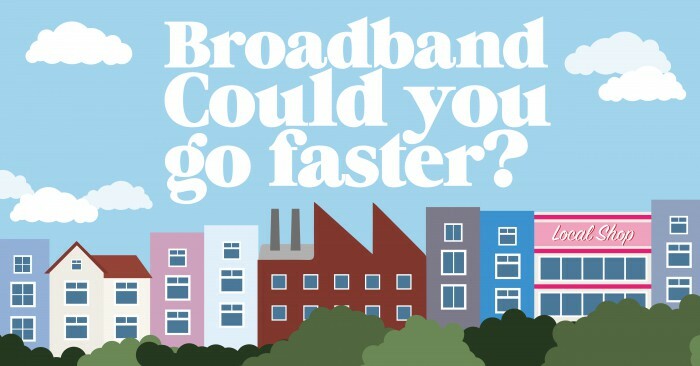 What can you do with superfast broadband? Superfast broadband will transform your internet experience by enabling you to better do those things online which need speed – such as video calling, downloading movies, playing games online – without slowdown and buffering, even when other people in your home are online. For people working from home, you’ll be quicker and more productive with superfast broadband. Often by making a few small changes at home we can get more from our existing connection. Find out how. Make sure you have checked the above sites to make sure you can’t already access super or ultrafast broadband.